Spiders are one of those critters that instil fear in the hearts of many That is for good reason. Spiders not only look intimidating, some can be dangerous and even deadly. Spiders are expert hunters that feed on moths, flies, mosquitoes, and other insects. Some species capture and disable their prey, wrapping it tightly in silken web. Others use fangs to inject venom and paralyse their prey. Some spiders are timid, while others will readily bite when threatened. Not all spiders are dangerous to humans, and many are useful for insect control. While most spiders are harmless, you should always seek medical attention for all spider bites. 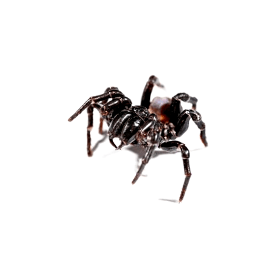 Spider control can prevent bites from accruing. The (Sydney) funnel web spider grows up to 5cm long. The females mostly stay inside their burrows waiting for prey to come to them. The males wander around, mainly at night. They can survive up to 24 hours under water. The funnel web spider is very aggressive, with deadly venom. It is known to attach itself to its victim whilst biting repeatedly. How many species of funnel web are there? Most people recognize the Sydney-funnel web, yet Australia has around 40 species of funnel-web spider including the Blue Mountains Funnel-web and even a tree dwelling species. Many others are yet to be described and their venom toxicity is unknown. While not all funnel-webs are venomous, every species should be treated with extreme caution. Where do funnel webs live? Funnel-webs are ground dwelling spiders that construct burrows in vegetation and under bark and logs in sheltered areas. The leafy north shore regions of Sydney with bushland and sheltered backyards are a preferred habitat for constructing burrows. The entrance to the hideout will contain silken threads to entangle prey and a characteristic funnel shape through which the spider enters and leaves the nest to hunt, normally at night. Will funnel-webs harm my pets? Funnel web spider venom is harmless to domestic animals and pets and only affects the nervous system of humans. For example, dogs and cats can receive large doses of funnel web venom that would normally kill a human, with no effects on their health. 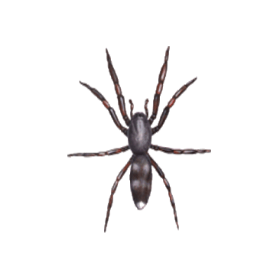 The female adult red back spider is easily recognised by the red stripe on her black back and can grow up to 10mm long. Red back spiders build messy looking webs usually around plant pots, down pipes, stored boxes and any other goods left unmoved for a longer period of time. Red back spider bites can make a human very sick and are also known to be fatal. What does the web look like? The redback spider constructs an untidy web with long sticky vertical threads sloping downwards which anchor it firmly to an object. If you look closely you may notice a funnel shaped retreat area at the back of the web where the spider hides, and often several yellowish to white egg sacs encased in the web. Common locations for webs include roof guttering, under eaves and ledges and around children’s playhouses and garden furniture. When searching for webs you should check obvious places such around window frames and storage areas. Also check disused areas such as backyard toilets and inside mailboxes (never place hands or fingers inside dark spaces without checking first!). How dangerous are redback spider bites? 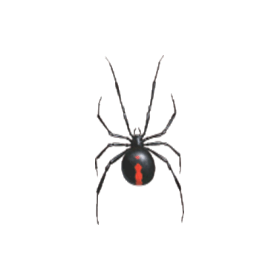 The bite from a redback spider can cause serious illness in humans and may be especially dangerous to young children, the elderly and those with heart conditions. Signs of poisoning may include nausea, severe pain around the area of the bite and intense sweating. Bites can also be dangerous to pets who may not show signs of poisoning for several hours. Fortunately the redback has a timid nature and will not bite unless the web or spider is accidentally disturbed or handled, also only the female is capable of a venomous bite. The white-tail spider does not make a home. It lives in wardrobes, clothing, linen cabinets and in shoes. But also in the garden, under rocks and leaves. They hunt their prey, usually other spiders. A bite is highly unpleasant but, normally the symptoms are mild and will resolve over time. How do I recognize a white-tail? In addition to the white tip at the end of the abdomen, white-tails have a unique cylindrical shaped body and a longer abdomen than most other spiders (in males it measures around 12mm and in females up to 18mm long). 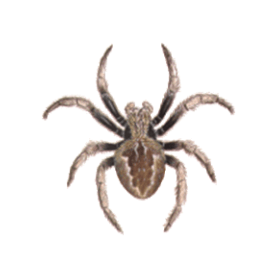 While they can be grey-brown in colour, the colour of individual spiders can vary from dark to reddish grey. The spiders normal body length is around 1-2 cm in length. Why do white-tails enter my home? White-tails often enter homes as they have a preference for cool dark habitats during summer and seek food and shelter after rain. They are also predatory on other spiders so will move indoors if there is a plentiful supply of food available. They do not construct webs but instead will shelter under objects such as piles of clothing and laundry, or outdoors under rocks and vegetation. Will a white-tail bite cause skin ulceration? The stories of white-tails causing skin ulceration following a bite are untrue according to doctors and spider experts such as Dr Lizzie Lowe from Sydney’s Macquarie University. 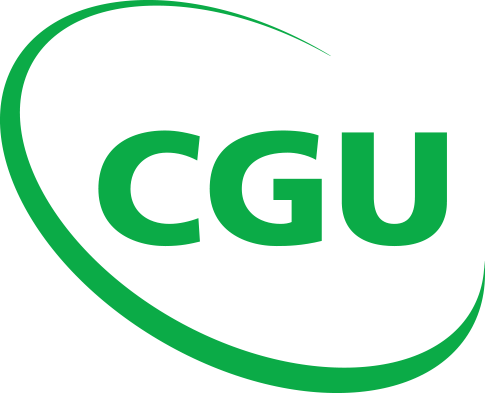 Any skin ulceration is thought to result from bacteria that enters the wound after the bite. The white-tail does however have deep fangs designed to penetrate the bodies of other spiders, so any bite would be extremely painful and include nausea, itching and skin discolouration at the area surrounding the bite. All the more reason to rid your home of white-tails! The wolf spider can be grow up to 35mm. It lives alone, mostly homeless, but some build burrows to live in. They like to wander around gardens, bush lands and can be found coastal and inland. The wolf spider is a nocturnal hunter with its 8 eyes providing excellent eyesight. It is not aggressive but, when provoked, the bite could be dangerous. There are many species of wolf spider. Some will grow up to 35mm in length. The colour of wolf spiders varies from brown to dark grey. They have eight eyes and excellent eyesight for locating prey. Wolf spiders are non-venomous but will bite if disturbed. A bite would not normally affect a healthy adult. Children may be at higher risk if bitten. Where are wolf spiders found? Wolf spiders are ground dwelling spiders and don’t build webs. They live in burrows or amongst leaf litter and vegetation. Parks and open woodlands are also favourite habitat. 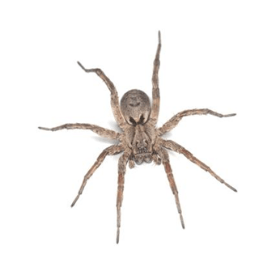 Wolf spiders are also agile hunters, chasing down insects and smaller spiders. They may wander indoors seeking food or shelter. Mouse spiders often get mistaken for funnel webs. They grow up to 3cm and live in burrow-like holes with a trapdoor. The female usually stays inside waiting for prey, mainly insects. The males wander in search of a mate. The venom is similar to the funnel web spider’s but not as aggressive and when they bite their venom is often not injected. Can mouse spiders be mistaken for funnel-webs? Mouse spiders may be confused with funnel webs, as both are glossy black. The difference is that mouse spiders have a stockier body, a broader head, and larger jaws than funnel webs. They are also smaller than funnel webs, with a body size around 10mm-35mm. Male Eastern Mouse Spiders are easy to identify, with attractive orange or red markings. There is also a bluish patch on the abdomen. 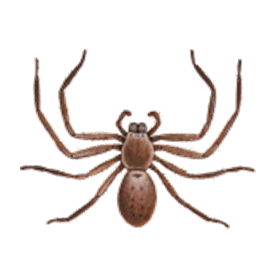 Female mouse spiders are dark brown to black. How venomous are mouse spiders? Mouse spider venom is highly toxic. Despite this, no human deaths have ever been recorded and bites are rare. This is because mouse spiders (unlike funnel webs) are not as common in suburbia. Always seek medical attention for any bite. Mouse Spiders are found across most of Australia. Their burrows are concealed under leaf litter. There is no trapdoor or visible entrance, just a doorway made of silk. The burrows are often located around creeks and waterways but are sometimes found in backyard gardens. Male mouse spiders sometimes wander during the day. The females remain inside burrows. The black house spider lives inside and outside. Inside it likes to sit in places where the light attracts prey. It builds messy and chaotic-looking webs that somewhat resemble a triangular shape. It is also equipped with a funnel-like hideaway where the spider resides most of the time waiting for prey. The female spends her entire lifetime in the web, coming out only at night to repair and mend it. How do I identify house spiders? 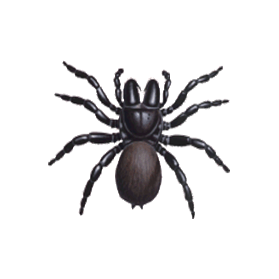 Black House Spiders are dark coloured with a velvety appearance. Females are larger than males (around 18-30mm in length). Males are smaller (around 10mm in length). The webs are funnel shaped and found in hard to reach places. Not to be confused with the funnel web retreat, which is always at ground level. The Black House Spider gives a painful bite. This may result in swelling and nausea. Fortunately, the spider is harmless and the bite non-lethal. Are house spiders only found indoors? 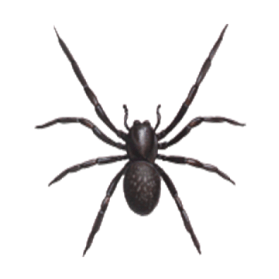 Black House Spiders prefer outdoor habitats, such as sheds, garages and junk piles. In spring time their search for a mate may bring them indoors. 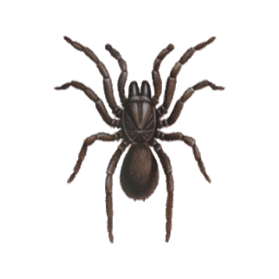 The brown trapdoor spider is often mistaken for the funnel web spider, but their bites are not dangerous. It lives in a silk lined open burrow in the ground. This burrow is approximately 25mm wide, but can reach 25cm in depth. The trapdoor spider spends most time inside. At night it will wait for food just outside the burrow. The males will wander on humid days looking for a mate. Where are Australian trapdoors found? Australian trapdoor spiders occur in most habitats. These range from eastern Australia to northern and mainland Australia. In Sydney, the most common species is the Brown Trapdoor Spider. Their burrows have no lid and are found on drier patches of vegetation and lawns. Trapdoor spiders are timid and avoid humans. They may act threatening if disturbed and display their fangs. A bite although rare, would be extremely painful. Do trapdoor and funnel web burrows look similar? Trapdoor burrows are different from funnel webs. They have a lid that closes to catch prey. Funnel web burrows have a silk lined entrance and no lid. The Huntsman spider has long legs, positioned on the side of its body, which makes it look crab like. It does not build webs but hunts for insects. It wanders into homes and can be found walking on walls and ceilings. It is fast and can jump, is peaceful but, when provoked it can attack and bite. When picked up it can ‘cling on’. The bite can be painful, but the venom is not harmful to humans. Most people have experience with huntsman spiders. Although these large spiders look frightening, they are non-venomous. They can still deliver a painful bite if provoked. Why do I find them indoors? Huntsman spiders feed on household pests. These include cockroaches, moths, and flies. They will also live outdoors where there are plenty of insects. How big can a huntsman spider grow? Huntsman spiders can reach impressive sizes. The Giant Green Huntsman is one of the largest species of huntsmen found in Australia, with a leg span of over 20cm. Its home is North Eastern Queensland. The garden orb weaving spider is a peaceful spider, often found in gardens in summer. When in danger it will drop to the ground and ‘play dead’. It spins big circular webs of 2 meters or more. Can be helpful by catching flies and mosquitoes. Their bite is not dangerous to humans but may induce mild discomfort. What colour are garden orb weavers? Garden orb weavers have a wide range of sizes and colour patterns. These range from creamy white to reddish brown. Some may have dots or stripes, others just a solid grey. Where are the webs found? The large web is wheel shaped and quite spectacular. It is constructed in late evening, strung between trees and bushes. The spider takes the web down by early morning. Should I get rid of garden spiders? You should not be concerned about orb weavers. They are beneficial as they eat garden pests. They will bite if threatened but are non-venomous.